W.S. Safety Technologies specializes in custom engineered fall protection systems, custom fall arrest, and confined space projects. We employ a highly customized approach to all of our projects and have years of capably implementing custom fall protection solutions for our clients. Our custom solutions take many of the organizational problems, stresses, and responsibilities associated with large projects away from our customer. Our crews are highly qualified and have extensive training including WHMIS, First Aid, Fall Arrest Protection, Man-lift Licences, Confined Space, Welding Tickets (where applicable), as well as training in the installation of the engineered fall protection systems. We installed the Latchways fall arrest system on the top of the CN Tower before the Edge Walk system was installed several years ago. W.S. Safety Technologies works in partnership with engineering companies that are in compliance with the local engineering authorities. Initial site visit, assessment, and proposal. Preliminary sketches of the proposed system. Custom fabrication by qualified crews. Drawings for the engineered fall protection system. Installation of structural steel by qualified crews. Supply and installation of fall protection system and components (we are certified installers for many different types of systems). Post-construction report from engineer indicating that the custom fall arrest system has been installed as per engineered drawings. Product orientation training in the safe use of the new system. 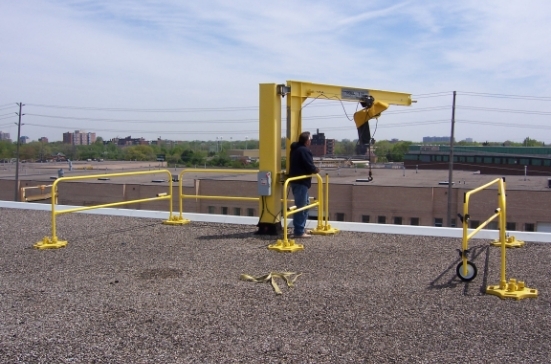 If you have a fall protection safety project that does not fall into one of our main applications categories, we can still provide a solution for you! Airplane fall protection, storage tank anchoring and generator fall protection are a few of our more unique fall protection applications. Occasionally we encounter extreme challenges in the field of fall protection and confined space rescue/retrieval. With our many years of experience and using a test approach we are able to resolve these situations with unique solutions. The customer wanted warning flags for their entire rooftop, consisting of standing seam metal deck roofing (with a slight grade), EPDM rooftops, and BUR rooftops. Our customer builds wings for aircraft and had a number of old platforms in use that weren't up to any codes or standards.